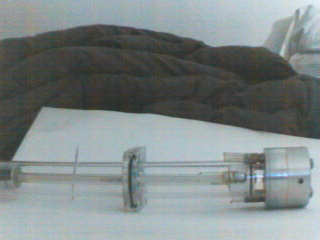 I bought this Co2 laser tube quite a while ago from a laser associate who I met on the alt.lasers newsgroups. There were a lot of great people on that newsgroup, and if you can still get newsgroups with your ISP or use another web based newsreader I’d certainly look into alt.lasers and see if there is any activity going on. This laser was a flowing gas, water cooled design. 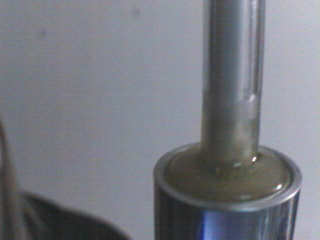 The cooling water flow was isolated from the end electrodes and flowed in through the side of the white ceramic bore ends. 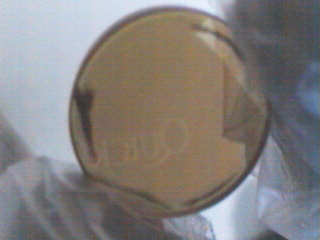 They are visible in some pictures as aluminum L shaped junctions glued into a white cylinder. The gas was fed into one end bell, while vacuum was pulled on the other to produce proper pressures for gas ionization and lasing. 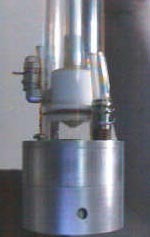 In the picture below you can see the three actual optical components which were part of this laser head Upper left is the output coupler / partial reflector. Upper right is the Total Reflector (as marked) / High Reflector. Middle Lower is a collimation or beam correction optic in a lens holder which was bolted to the front of the laser. 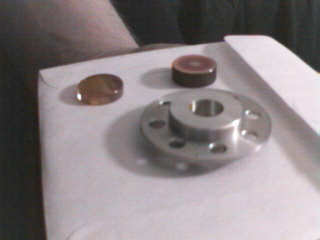 Here is another shot of the lens assembly piece. And here are a couple of closer shots of the Total / High Reflector. 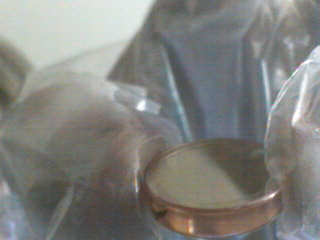 It is a 3/4 to 1″ diameter copper puck. These optics usually have a precisely calculated concave curvature ground into them. The curvature is calculated on bore diameter and bore length. 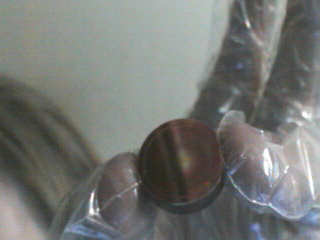 The optics are then they are highly polished and coated if necessary. As you can see in the picture this one had some hours of use on it and had become discolored over time. You will notice I am wearing gloves while handling these optics. While the copper is not really a big deal, the Output Coupler is Zinc Selenide or ZnSe which is not a ‘user friendly’ substance, particularly when it’s in the form of dust or airborne particles which can be inhaled. 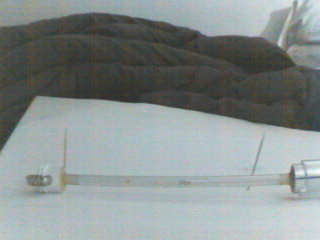 In this instance since the OC had some physical damage from the retaining components. Additionally, wearing gloves will protect expensive optical components from the oils on your fingers. If you look at these 4 pictures of the optical coupler you can see it’s semi-translucent. If the camera I had back then was of better quality you would be able to see the coating on the optic which makes it an Output Coupler or Partial Reflector. The OC optic in a laser has a partial reflectivity, which results in it also have a partial transparency and ‘couples’ the laser beam with the outside environment. This partial reflectivity in tandem with the HR make an optical resonator which is required to produce a lasing in this type of laser. In some cases, such as a TEA nitrogen laser, it is possible to initiate lasing without an HR or OC optic at atmospheric pressure! In the following four photographs you can see both ends of the laser. 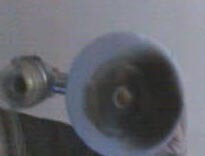 One end still has the end bell in tact, while the other is unsheathed from the broken glass tube. 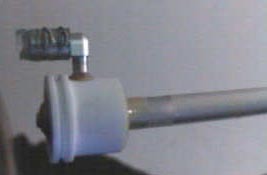 There are two metal couplers along the length of the laser which join the the three ceramic bores and the barely visible (in these pictures) water jacket just outside of the bore. The total length of this laser was 37-42″ inches. 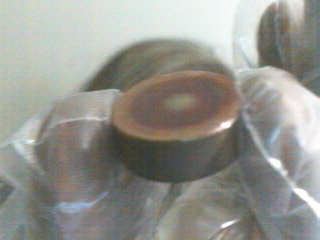 In the next few pictures you get a closer look at the end of the ceramic bore. The machined aluminum L shaped components are for the coolant to enter and exit the water jacket, which is more visible in these photo’s as a thin, clear, plastic shroud around the ceramic. This is a very sleek design as compared to the 85 Watt Co2 Laser you may have already seen on this page which has a much larger glass (borosilicate) bore and an even larger water jacket. 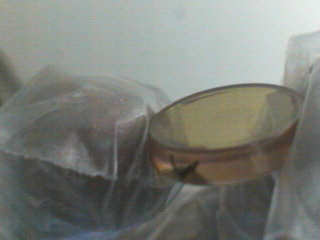 In between the raised ridges of this end piece was a viton O-Ring which sealed to the outer glass casing. The black deposits were very well embedded into the ceramic, but I believe are a result of sputter caused by forming a plasma in a low pressure vessle. The inside of the bore was surprisingly clean. 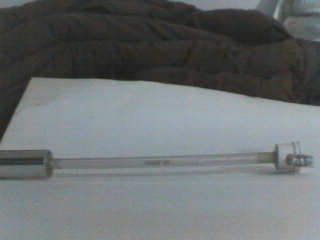 In the following shots you can see an in-tact end of this laser tube. In the upper left is a cooling water inlet/outlet. On the bottom right is a lasing gas inlet/outlet. Bottom center of the picture on the right side, a spiral round metal ring, is one of the high voltage electrodes of the laser tube. 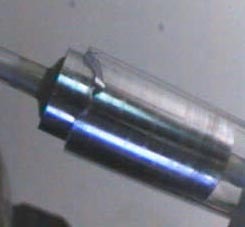 The screw mounted into the metal end bell slightly visible at the bottom of the picture is where one of the high voltage leads attach to the laser. 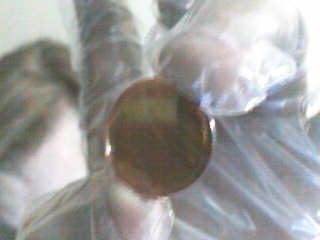 Also about dead center in the picture you can see the red colored Viton O-ring. Viton is a very durable material with high temperature resistance, as well as chemical resistance. If you get enough used laser equipment, over time, you’ll see these are almost a staple item in the gas laser industry, and also seen a lot in solid state lasers such as flash lamp or arc lamp pumped lasers, such as Nd:Glass or Nd:YAG. Here, below, is a better shot inside the end of the end bell. Both ends of this laser are pretty much the same thing from this perspective, just one end holds the HR and the other the OC. The 4 black dots are hex screws used for adjusting the alignment of the optic. Inside of the end bell cavity you can see a ceramic disc with a hole through it. 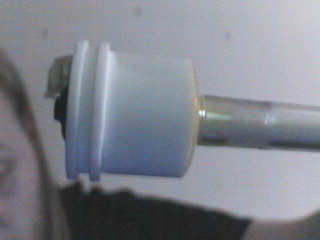 This is the white part with the electrode on it, in the closeup picture above. Outside of that you can see three small black dots. These are spring loaded balls, which caused the 3 score marks on the Output Coupler, as seen in the photos near the top of this page. Once the optic is in place, a sealed retainer is threaded into the cavity to hold the optic against the mount and seal it from the outside world. 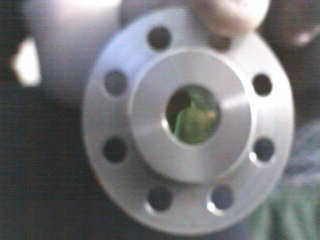 The first picture of the next set is a closer shot of one of the center couplers for the bore and water jacket assembly. If you look closely you can see that the possibly acrylic water jacket has been mechanically roughened or sanded to provide a better sealing and gluing surface. The brown colored stuff between the water jacket and outer metal casing appears to be some sort of epoxy, I do not know if it has any special properties above normal epoxy. There are also 3 additional shots of these center couplers and support pieces. You can see how thick the housing is as well. 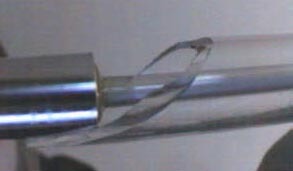 Please keep in mind that water or gas did not flow inside of this big glass tube, they only flowed in the inner water jacket which is slightly larger than the laser bore. In these final pictures, I shone a red laser pointer up the center of the bore. You can see by the bright spots on the ceramic bores where the fractures, from shipping damage, had occurred along the length. I hope you enjoyed these photos and this description. Please check out my other laser write-ups and projects. I really wish I had been able to fire up this laser and test it out. It is a unique design compared to many of the other Co2 laser designs I have seen in person. If you happen to have one lying in spare, or have pulled it out of a working unit and would consider getting rid of it, please use the contact information on this page to get a hold of me. i looked everuwher can could not find an anseer to my question. I have a question you might be able to answer. 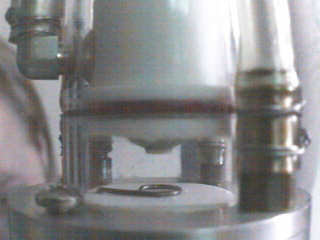 In photo’s of many commercial co2 tubes, I noticed a glass tube spiral inside the outter glass but outside laser co2 tube. 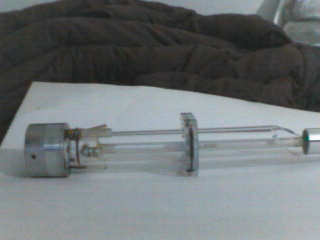 Can you tell me what this glass tube spiral does ? No water runs through it . You’ll find this spiral in sealed Co2 laser tubes. Sealed Co2 laser tubes require a catalyst in order to process the gas inside of the tube continuously to keep it capable of lasing. The spiral tube to my understand provides a a longer return path for the gas allowing it time to interact properly with the catalyst. Actually, I want to make CO2 laser by myself. So, I read your post. There is hole in the middle of Output coupler? If you reply to my e-mail, I would be really appriciated. There is no hole in the output coupler, it is totally solid. 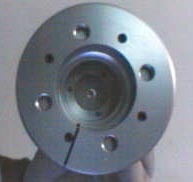 The picture you see with the hole in the center is without the output coupler installed.